Sometimes, the best way to celebrate the efforts of real life super-heroes is to contrast their nobility and courage with those from the world of pop culture. 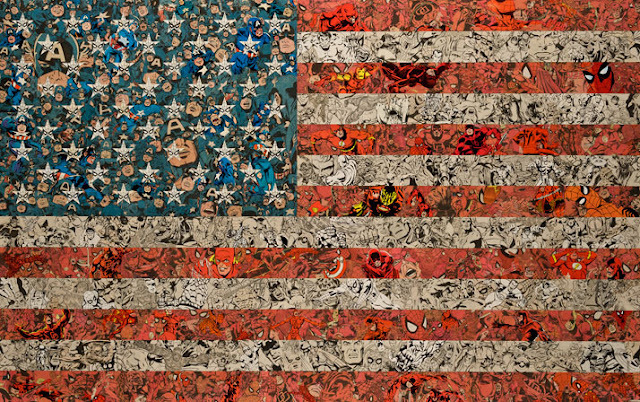 In his exhibition Supermen - An Exhibition of Heroes, London-based artist Ben Turnbull created a series of iconic American themed images, constructed from fragments of comic book pages, using Captain America, Daredevil, and The Flash as well as Iron Man and others to achieve his results. 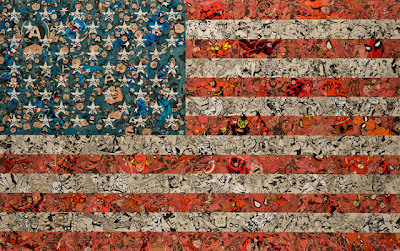 Showcased at Eleven Fine Art in London in late 2011, Ben's bold artwork captures the post September 11th feeling, while combining the sentiment with some of the nation's best American-made heroes of an altogether different kind. For more of the exhibition, click the jump.